Shchavel Borscht (sorrel soup) is sour, light, very little ingredients, easy to make and very popular dish among Ukrainian families. 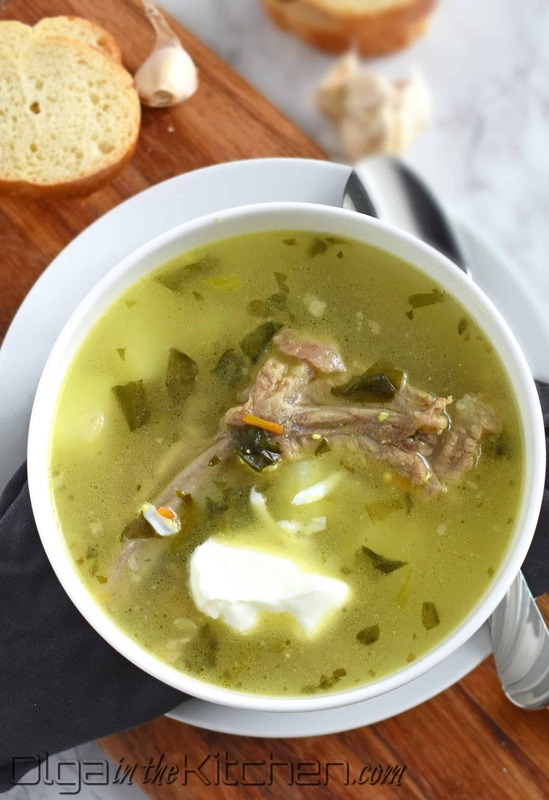 Most Ukrainian soups require sautéed carrots and onions, but this soup is more concentrated on the sorrel and its sourness. Adding sautéed onions/carrots to this dish will not only overpower the sorrel, but it completely changes the taste of this dish. 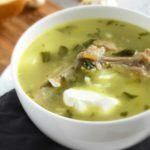 This soup is always served with a teaspoon or so of sour cream, and most Ukrainians like to enjoy it with a clove of garlic. I’m not much of a garlic eater, so a slice of bread always completes this dish for me! 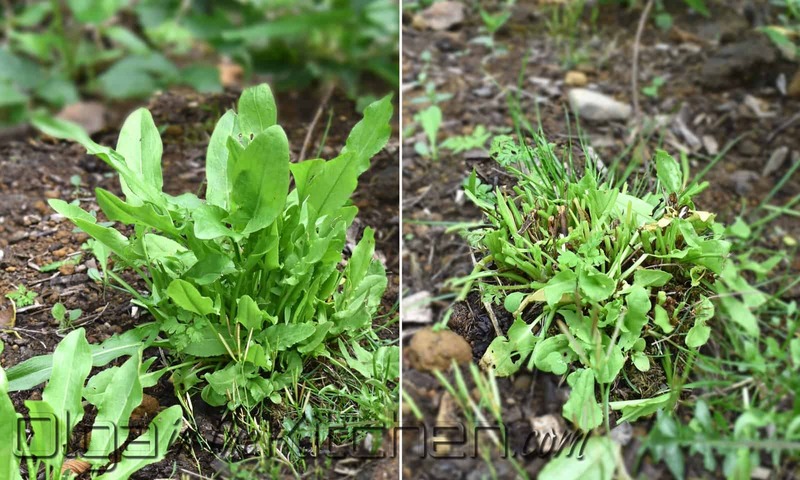 Shchavel (sorrel) re-grows every year; once it’s cut, it grows back. My mother-in-law brought us little sorrel bush from her garden that we planted in our garden, and when our sorrel is ready to be cut, we make the borscht again and again. I remember my mom would cook the sorrel and store in jars, so we would use over winter. We don’t have enough to can, just enough to enjoy once a month. I hear you can find canned sorrel at local Ukrainian/Russian or European stores to purchase. You can also purchase seeds online and plant them in your garden for many years to come, just don’t forget to water! 1. 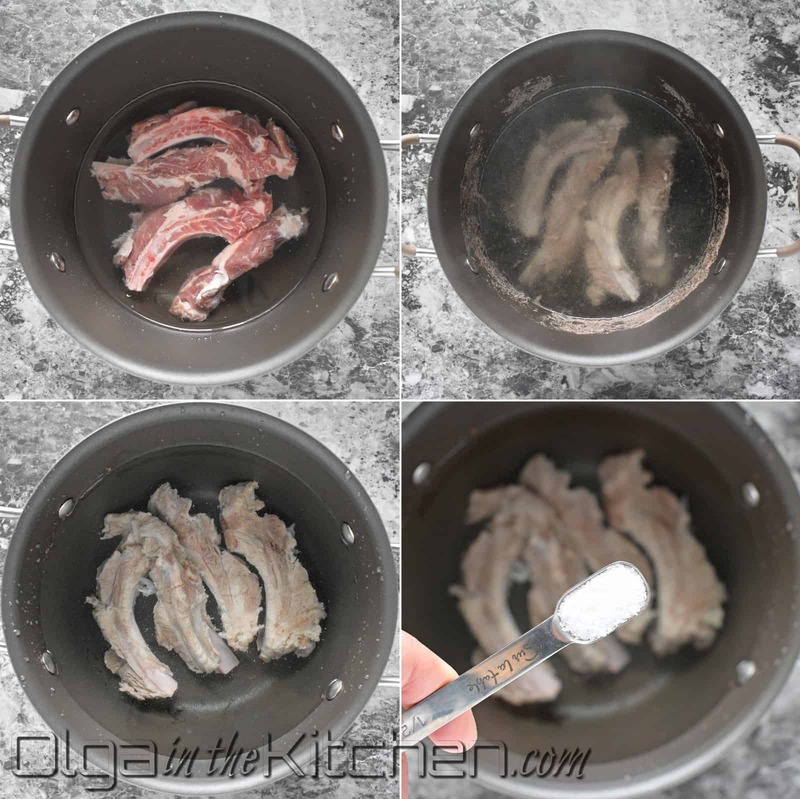 Place 4 pork ribs into a large pot filled with water (1-2″ of water over the ribs). Bring to a boil. Once you see the brown foamy stuff on top, dispose the water and rinse pot and ribs to remove any impurities. Put the ribs back into the pot, add 1/2 tsp kosher salt and 10 cups of water. Bring to a boil, lower heat to low and cook ribs for 1 hour. 2. 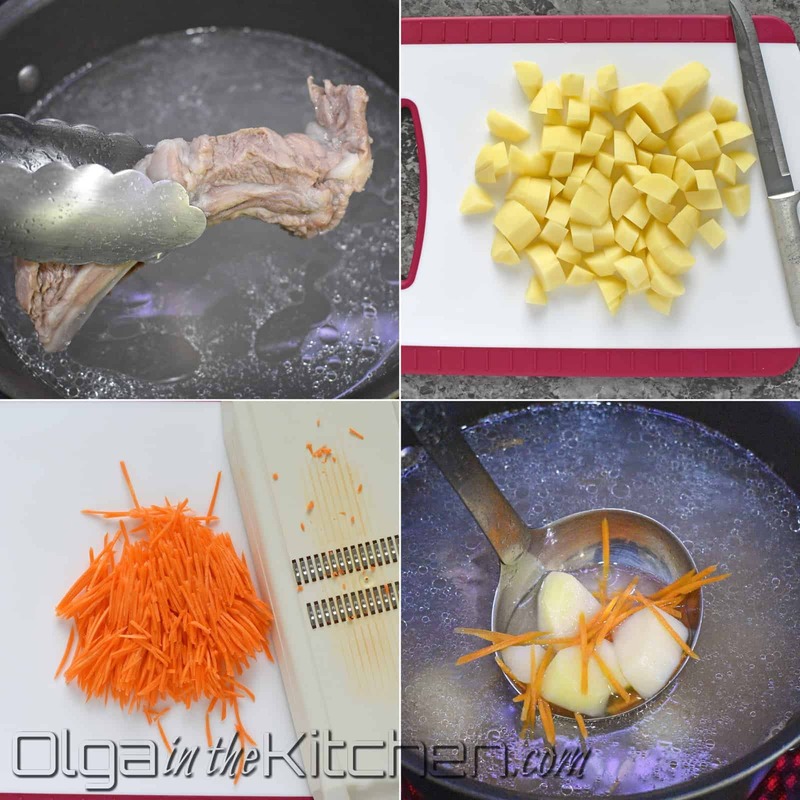 Once ribs are cooked, dice 4-5 medium gold potatoes, and grate 1 large carrot onto a julienne slicer. Add the diced potatoes and grated carrots into the pot with borscht. Lightly boil for 15 minutes or until potatoes can be easily pierced with a fork. 3. Stir in 2 cups fresh chopped shchavel (sorrel). Return pot to a boil and simmer additional 3-4 minutes or until sorrel is soft. Add 2 tbsps unsalted butter. 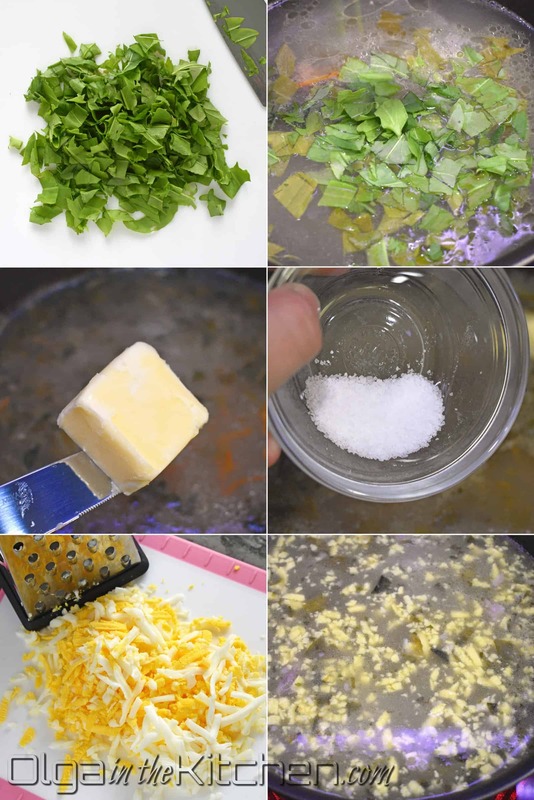 Once butter had melted, add remaining 1 1/2 tsps salt or to taste. Stir in 2 boiled eggs, grated onto a big hole. Bring the borscht to light boil, turn off the heat. Serve hot with a teaspoon of sour cream, a slice of bread and a garlic clove! 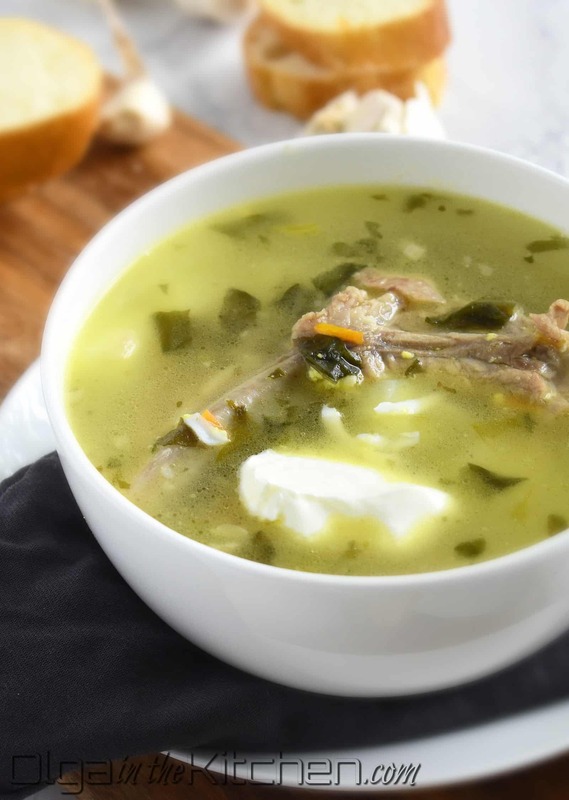 Shchavel Borscht (sorrel soup) is sour, light, very little ingredients, easy to make and very popular dish among Ukrainian families. Place 4 pork ribs into a large pot filled with water (1-2″ of water over the ribs). Bring to a boil. Once you see the brown foamy stuff on top, dispose the water and rinse pot and ribs to remove any impurities. Put the ribs back into the pot, add 1/2 tsp kosher salt and 10 cups of water. Bring to a boil, lower heat to low and cook ribs for 1 hour. 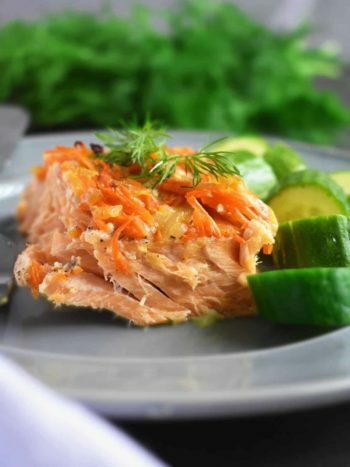 Once ribs are cooked, dice 4-5 medium gold potatoes, and grate 1 large carrot onto a julienne slicer. Add the diced potatoes and grated carrots into the pot with borscht. Lightly boil for 15 minutes or until potatoes can be easily pierced with a fork. Stir in 2 cups fresh chopped shchavel (sorrel). 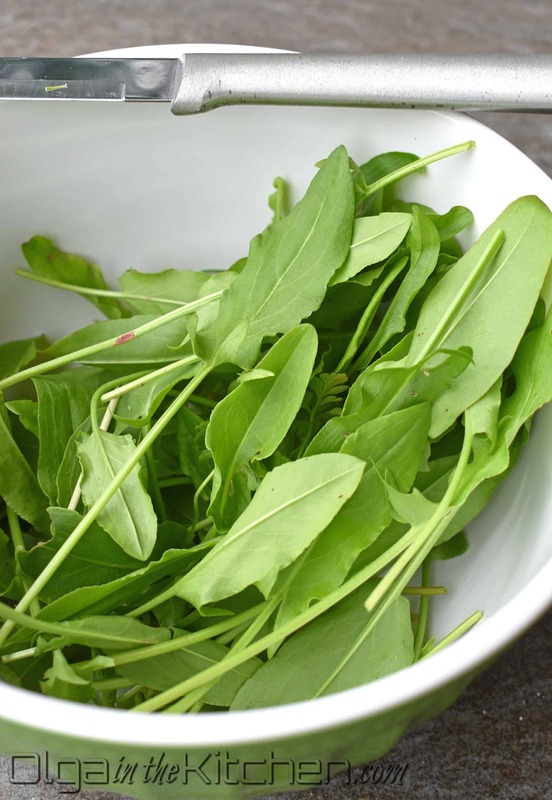 Return pot to a boil and simmer additional 3-4 minutes or until sorrel is soft. Add 2 tbsps unsalted butter. Once butter had melted, add remaining 1 1/2 tsps salt or to taste. Stir in 2 boiled eggs, grated onto a big hole. Bring the borscht to light boil, turn off the heat. 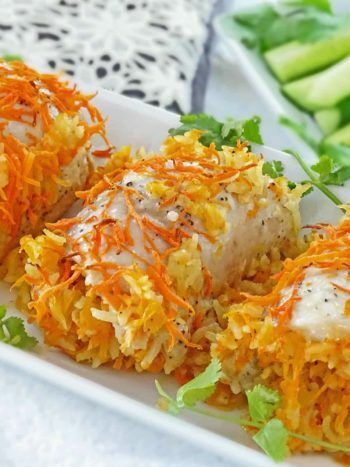 Serve hot with a teaspoon of sour cream, a slice of bread and a garlic clove! Hi Olga! We are old folks and love eating healthy. 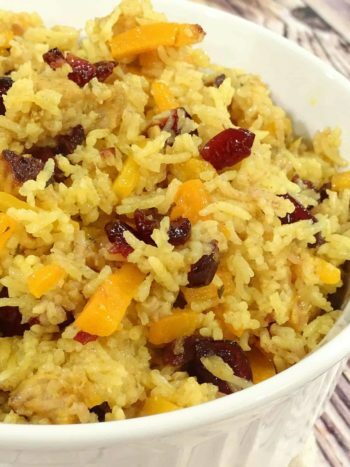 We found your recipe for this borshch and it became a staple for me and my husband. 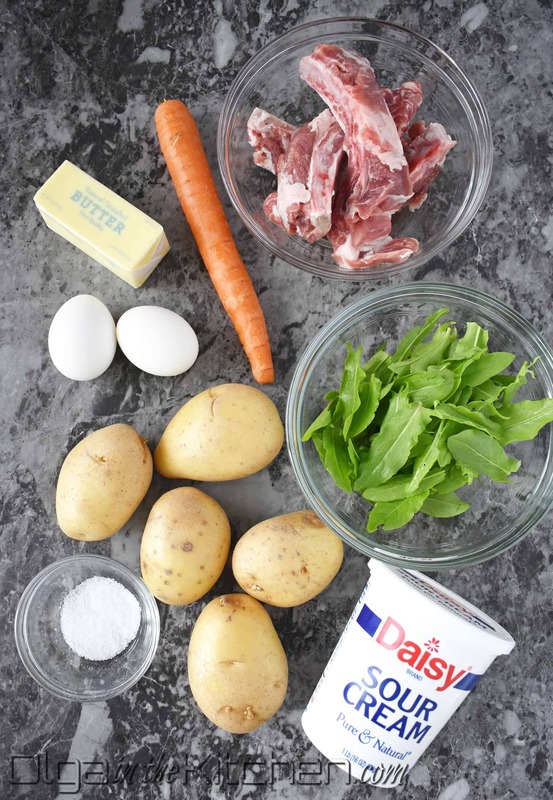 It’s really easy to make and very delicious. I tried few other of your recipes and you’re a very talented young cook. Hard to find bloggers who cook such incredible meals.